In recent years it has become apparent that fiber-optics are steadily replacing copper wire as an appropriate means of communication signal transmission. They span the long distances between local phone systems as well as providing the backbone for many network systems. Other system users include cable television services, university campuses, office buildings, industrial plants, and electric utility companies. 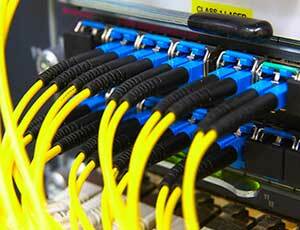 A fiber-optic system is similar to the copper wire system that fiber-optics is replacing. The difference is that fiber-optics use light pulses to transmit information down fiber lines instead of using electronic pulses to transmit information down copper lines. Looking at the components in a fiber-optic chain will give a better understanding of how the system works in conjunction with wire based systems. Signals can be transmitted further without needing to be "refreshed" or strengthened. Greater resistance to electromagnetic noise such as radios, motors or other nearby cables.